A Howard University senior spent a recent Friday afternoon checking on his garden plot at the Blair Road community garden in Northwest D.C. He talks about what inspires him to garden, among the hustle and bustle of a big city. WASHINGTON — Suburbanites aren’t the only ones dodging raindrops and playing catch-up on their weeding after weeks of wet weather soaked their gardens. 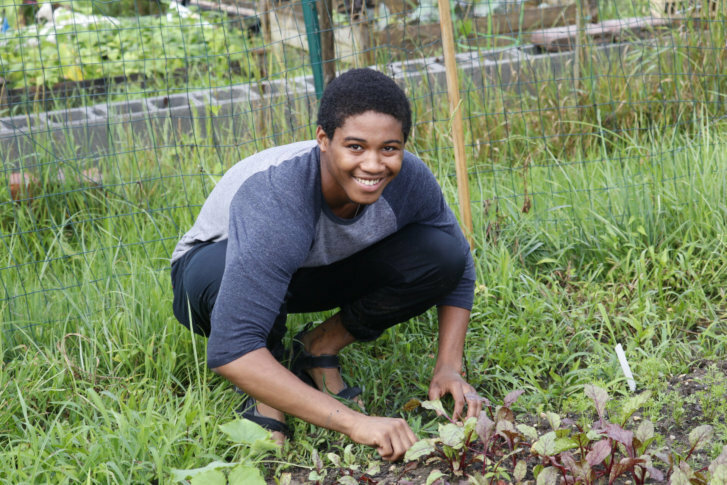 Howard University senior Sidney Brooks spent a recent Friday afternoon checking on his garden plot at the Blair Road community garden in Northwest D.C. Asked what inspired him, a college student, to put in the time and effort to tend to a garden, he said simply,“ I like to eat vegetables.” Brooks added he is always been interested in the natural world. As a high school student he took part in ‘enviro-thons,’ and ever since, has been looking for chances to get his hands dirty. Thanks to this summer’s weather pattern, Brooks hasn’t just gotten his hands dirty, he is also been getting muddy. He picked his way along the rows of carrots, beets and peppers in sandals, his feet sinking into the mulch with each step. Even in a big city, he gets up close with nature. Brooks said he and his girlfriend got a late start on their garden, but they’ve got some promising looking tomatoes, the beets look good and the carrots are coming along as well. Peppers are the only produce item Brooks has been able to harvest this season. Across from his plot, someone decorated their section with a little sign that read “Bless this garden,” and rows of corn towered above tomato plants. And just a few yards away, there was a periodic reminder that this pocket of green space is in a major city: Metrorail, Amtrak and freight trains rolled past.